My wife made a sweet granita dessert after attending a cooking class which was really good, so the idea of creating a dish with granita stuck with me for some time. 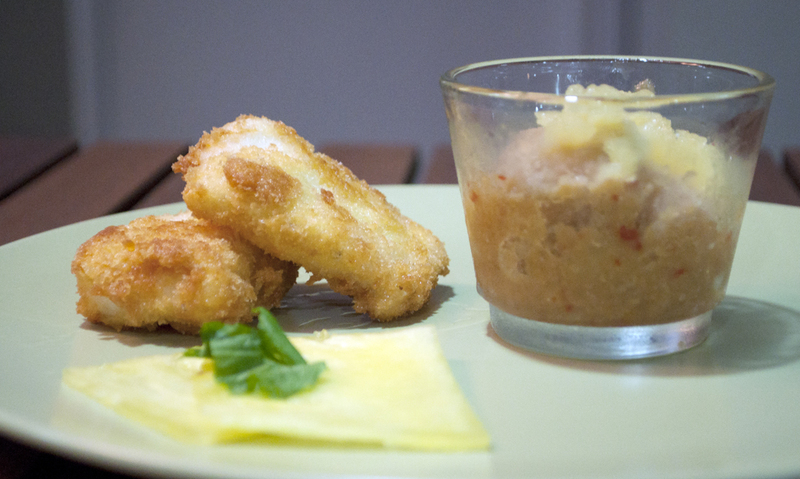 I was craving for Asam pedas fish one of those days and it seemed like a great chance to make a Asam pedas granita. Result? One of those dishes that are just fun to eat. Full of contrasting flavors and textures. Drain the excess oil on kitchen towel and quickly place on a drying rack. Do not leave the fillet lying on the kitchen towel as it will get soggy. This entry was posted in APPETIZERS (Petite Mouthfuls), SEAFOOD (Ocean's Gifts) and tagged Asam, Asian, crispy, granita, recipe, seafood, snapper by Whisky Uncle. Bookmark the permalink.